What is the link between Migraine and PFO ? The link between migraine and PFO is . . .
Answer : One of the above is correct , but we do not know which one is ! There has been many patients with TIAs , cryptogenic strokes , who had documented PFO ,complain of prolonged head aches . This was the beginning of suspicion of PFO as a cause for migraine .Then the device industry foresaw a huge opportunity . Things began to unfold and the concept is currently as nebulous as it can be . Right to left shunting of vasoactive amines from venous circulation (Serrotonin) which bye- passes the lung where they are supposed to get filtered. What is the incidence of migraine in the prototype right to left to shunt situations like TOF, Eisenmenger , pulmonary AV fistula ? if shunting is the mechanism , logically migraine incidence should be very high in this population , but it is not . Migraine occurs in 10 % of population, PFO is present in 20% . What are the chances of over lap ? It could be the simple statistics at play ! Where is the evidence ? The mystery called MIST study. This study , done in UK generated more controversy , which it was supposed to remove . Still this study is considered to be a major evidence for the link between PFO and migraine . Star flex device was promoted by NMT medical Boston . We expect a proof / disproof in this mysterious migraine -PFO hypothesis very shortly. Of course , many cardiologists already have their own conclusions ! When HCM involves LV apex exclusively . . . nothing much to worry ! HCM is due to hereditary mutation of myocyte sarcomere .The molecular defects are located in myosin, tropomyosin, titin .Depending upon the protein involved the hypertrophy can be regional or localised. Non obstructive types most often involve tropomyocin mutations. Obstructive types predominate with myosin mutations. Apical HCM can still be prognostically and practically important even though there is no hemodynamic impact. 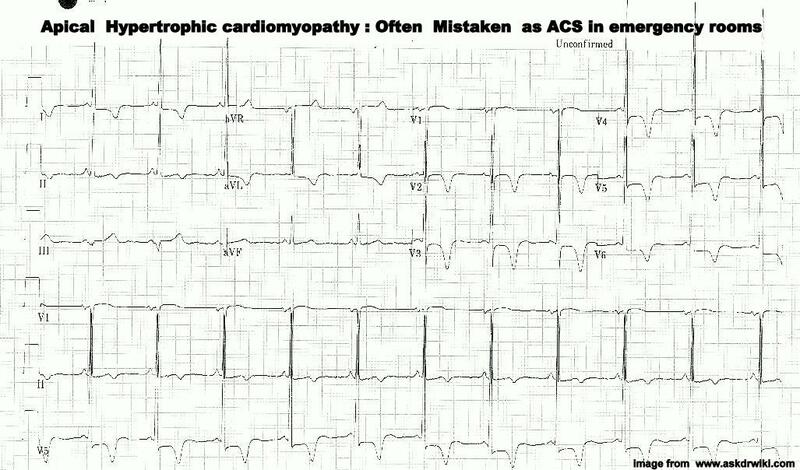 More importantly apical HCM is the commonest myocardial condition mistaken for unstable angina and they wrongly enter the ACS protocol and might land up in cath lab tables as well ! Always remember high voltage qrs with deep T wave inversion (90 out of 100 times) is due to myocardial pathology not ischemic. Just follow up with yearly echocardiogram .Follow up the siblings too. Holter monitoring or extended loop recording may be done to detect any sub-clinical of arrhythmias. Beta blockers are generally not indicated routinely may be given if family history of sudden death . What is the direction of blood flow across patent foramen ovale(PFO ) in otherwise normal adults ? No significant flow at all ! 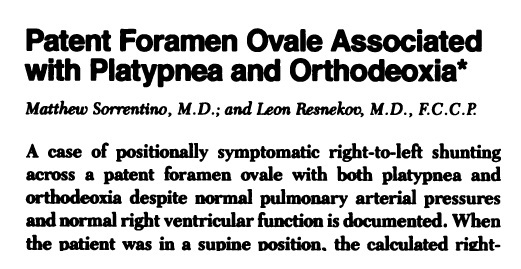 The patent foramen ovale is a physiological orifice , which becomes pathological if persist into adult hood .The incidence is estimated to be about 20 % of the population (Amounts to 100 crore PFOs roaming in our planet!). It makes no sense to believe just spotting a PFO in routine echocardiography be termed as pathological . But recently (Adding much to interventionist’s delight ! ) the presence of which is being linked with migraine and stroke in young. The size of the orifice can be from a single millimeter to one centimeter* . The direction of blood flow in PFO is determined by the mean gradient across the orifice. It has to be left to right as the LA pressure is generally higher by few mm mercury ,hence there is a small tide of flow entering into RA with each left atrial filling or contractile wave . (v and a ). This quantum is miniscule and has no hemodynamic significance in most life situations. * Some call( Wrongly ) 1cm PFO as small ASD. When can Right to left to flow occur ? When the right atrial pressure increase more than LA pressure it is obvious blood can enter LA . It is well-known this occurs in any pathological situations like RVOT obstruction severe PHT , tricuspid valve obstructions etc. Forced expiration (Valsalva) can cause transient right to left flow. This may happen in many real life situations like straining, heavy isometric exercise, blowers, muscians etc. Which is clinically significant ? Left to right or right to left ? Left to right shunting is rarely an issue as there is no systemic desaturation. Shifting of venous debris into arterial side can result in potential paradoxical embolism . (This can be air, clot fat , amniotic fluid etc) This is the reason stroke in young is closely linked to presence of PFO. PEEP is a classical example where a right atrial positive pressure , shunts the blood in pulsatile manner into left atrium . This is postural right to left shunting across PFO .It is a less recognised (but a common entity) where -in , when the patient lies down there is a right to left PFO shunt and transient hypoxia .This is often corrected as the patient sits up. The reason being the valve of PFO , the door like flap which guards the orifice , is aligned in such a fashion , it opens up in a lying posture(Aided by gravity ?) , shuts down in sitting posture .It should be noted The PFO valve is not a constant feature . The size of this valve , the stiffness , the hinge points , ability to float are highly variable .Hence the clinical variation in PFO syndrome. The IAS septal aneurysm is an important variation where the valve of PFO balloons out into left atrium may become a nidus for thrombus or a focus for atrial arrhythmias . 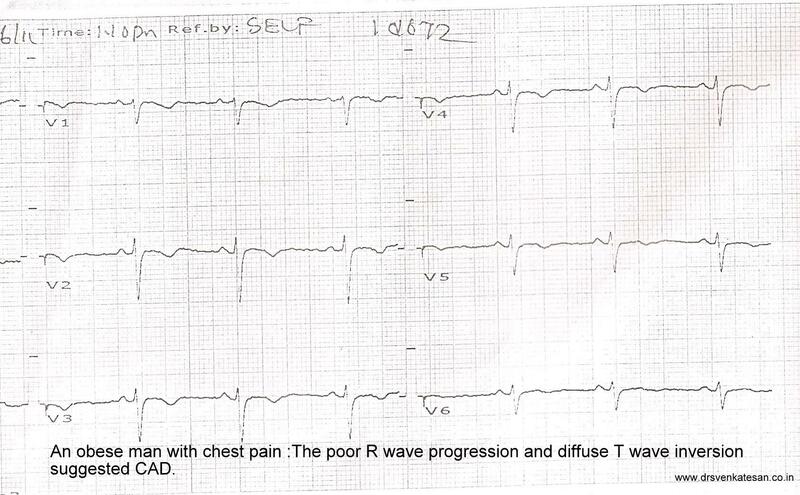 ECG diagnosis of thickened epicardial fat pad . A 50-year-old man was referred to us with suspected angina. 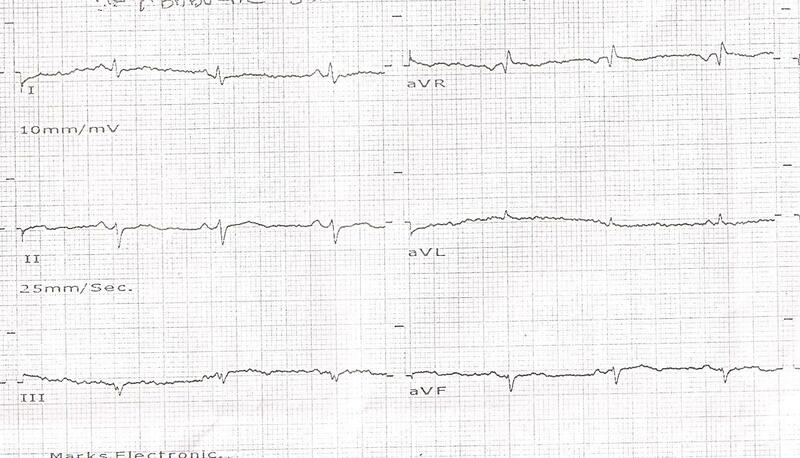 Here is his ECG. He was an obese man weighing 105 Kgs. He was put on a tread mill .It was convincingly negative . The echo cardiogram revealed a prominent epicardial pad of fat measuring 6mm throughout the anterior surface.He had normal valves and normal myocardial function.It was concluded the low voltage and poor R waves , and T wave inversion was due to the thick epicardial fat. The lack of R wave progression is attributable to the insulation effect of fat .Chest wall fat rarely dampen the electricity .Epicardial fat does it more.T wave inversion may not be due to dampening effect of fat .We think epicardial fat when adherent to true pericardial surface of the heart it alters the epicardial action potential .It is possible electrical neutralisation by the fatty infiltration of epicardium reverses the direction of repolarisation towards the epicardium . Epicardial fat deposits can have clinically important influence on the surface ECG recording . Simple chest wall obesity causes only diminutive R wave . If fat encircles epicardium it has high chances of producing repolarisation abnormalities in the form of T wave inversion or flattish ST segment. Doing bad with good intention ! Human body is a bundle of mystery. In an average life span of human beings, millions of afflictions come and go . Most are benign . Our body has a full-fledged defense ministry armed with sufficient weaponry in the form of , immune cells, thousands of regulating enzymes, hormones , cell service molecules etc .It can tackle most of the ailments our body encounters with out a doctors help (Jungle animals rarely die of disease!) . Of course , the body needs external help when it’s intrinsic resources fail . There are few serious disorders that has to be intervened .However ,a big fraction of them will die in spite of whatever we do . Is it not fascinating to know more than 100s of chemicals act day in, and day out , to prevent our blood from clotting and keep it flowing . If only the natural lytic mechanism fails for an hour , and create a vascular chaos we will realise importance of it ! When a child presents with physiological hypertrophy of lymphoid tissue , as their body begin to learn and record the micro biological mysteries of our environment , it is often “cross labeled ” as tonsillitis or appendicitis and end up in surgical tables. This article just released in European heart journal , tells us , how the rampant use of appendectomy and tonsillectomy in the early child hood may make them susceptible for CAD in later age group. The role of medical professionals is identify the trivia ! and prevent unnecessary interventions. Unfortunately or (Should I say dangerously) many of the professionals understood it in a diagonally opposite manner . Identify the trivia , instill fear in our patients and intervene , in the process injure our great biological system.This is also applicable to many cardiac interventions. Heavens sake , youngsters , please remember , medical profession is all about removing suffering from patients . Do not fish out “non -existing” illness from your patients body ! Let me remind you , professional approach means , whatever you do it should be in the interest of our patients . The moment you deviate , you cease to be professional . Also realise , good intentions can never be an excuse for inappropriateness ! How does Beta blockers help in vaso vagal syncope ? It is a well proven concept beta adrenergic blockers have a useful role in controlling the frequency, and intensity of vaso- vagal syncope . One may wonder how an anti adrenergic drug help to counter hyper vagotonia syndrome ! This is because during vaso -vagal syncope , the inital trigger is sympathetic . A sudden hyper adrenergic surge occurs that stimulate the vagus, ( Which overshoots the initial quantum of adrenergic signal) and cause a systemic vasodilatation , hypotension and bradycardia. How does adrenergic surge stimulate the vagus? Cardiac stretch caused by hyperadrenergic activity . This stretch initiates a vagal reflex especially from the base of the heart (Similar to Bazold Zarish reflex ). This mechanism is thought to be more important than brain stem spill over , that’s why it is referred to as neuro-cardiogenic syncope . How does beta blocker help? It sedates the adrenergic centre which modulates the trigger .It also blocks the sympathetic afferent limb of the syncope circuit. Anxiety and panic reactions are close associate’s of vaso- vagal syncope. They are not only considered as prodrome for syncope but also act as important triggers.This is effectively tackled by beta blockers . Finally , beta blockers soothes the mycardial stretch receptors by reducing the ventricular shear stress (Reduced contractility and wall stress ) hence neuro-cardiogenic axis is pacified. It is important to remember beta blcokers can only prevent/ reduce episodes of vaso vagal syncope. It may aggravate the situation if administered shortly after the event , as bradycardia and hypotension is dominant in the recovery phases. *During an episode of vaso vagal syncope atropine group of drugs is most useful . Propronolol is the prototype as it has non selectivity and good penetrance of blood brain barrier , which is the most appropriate site for suppressing hyper adrenergic drive. Cardio selective beta blockers do have a role as cardiac stretch receptors is one of the two target sites . Ironically , in the long term management of vaso-vagal syncope , anti adrenergic drugs have a major role rather than atropine like drugs . Catheter whip + Calcium in aortic valve = Stroke . . . but TAVI is safe ! There was a time , even cardiac catheterisation was contraindicated if the aortic valve is significantly calcified. LV angiogram was judiciously avoided in all such patients . Why ? A significant increase in disabling strokes were witnessed .Those were the time a sense of fear (common sense ?) prevailed . Every one was following this dictum with sanctity . Now in 2010 .TAVI has arrived with great fanfare . We not only cross the calcific valve , we literally play a violent contact sport in the aortic root for over two hours with all sorts of pushes and passes on a fragile valve.And we are happy to claim that stroke rate is comparable to aortic valve surgery and TAVI is not-inferior to AVR in high risk surgeries . Data shows even if distal protection devices are used the stroke rates can reach to objectionable levels .It remained a mystery , at least to me how no body was questioning this ? I was happy to find this editorial in NEJM which just stopped short of banishing this modality in its current form. What price it asks ? and leaves the readers to guess the answer ? NEJM wants to be too decent and polite , but in science politeness is generally not required , as long as your observations are correct ! For all those enthusiastic interventional cardiologists here is a positive message . Nothing comes easy in science.Great inventions do have problems initially . Without major hurdles there can be no progress ! It is because of you modern cardiology is making giant strides . Remember the early days of angioplasty , early days of pacemaker . But please realise the most important issue is , whatever we innovate or discover it should be shown superior to the best existing modality in all aspects(Technique, procedural complications, long term outcome ,costs, side effects etc ) .It is awful to note new drugs or devices are rarely compared with the best treatment that is currently available . A new treatment that simply complements or proves non-inferiority can never be considered an invention. How can we portray radio frequency renal denervation ( a complex lab procedure ) for controlling blood pressure as a great innovation for man kind while we have so many drugs and modalities available at a fraction of the cost with little consequence .